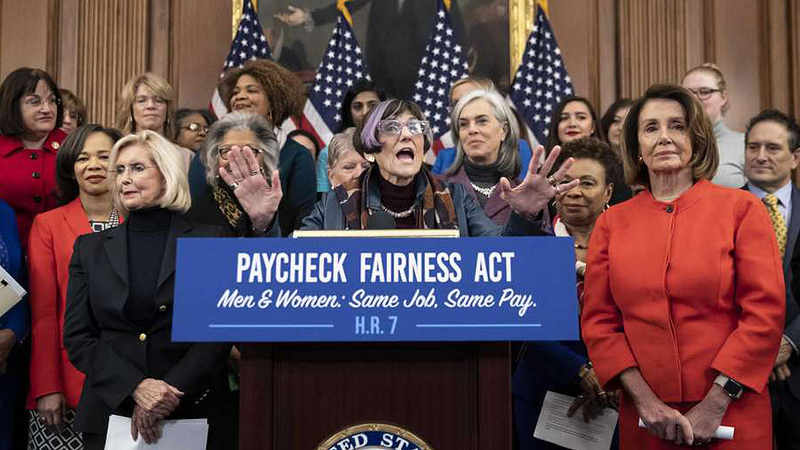 WASHINGTON–Backed by a wide range of unions and women’s groups, veteran lawmakers, Rep. Rosa DeLauro, D-Conn., and Sen. Patty Murray, D-Wash., have reintroduced the Paycheck Fairness Act — a measure designed to put enforcement “teeth” into the nation’s 56-year-old equal pay law. 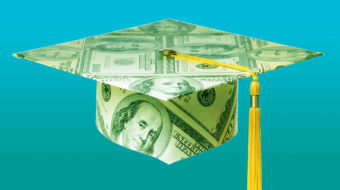 And this time, with Democrats running the House, and with DeLauro, one of their veteran vote-counters and most-influential members leading the way, the bill will finally get a House Education and Labor Committee hearing and OK, after years of GOP obstruction, Chairman Bobby Scott, D-Va., promises. The Coalition of Labor Union Women enthusiastically backed the Paycheck Fairness Act and helped ensure every House Democrat, plus one Republican is a co-sponsor. Backers include House Speaker Nancy Pelosi, D-Calif., the two leaders right below her and Scott. Rep. Chris Smith, R-N.J., the Garden State’s sole congressional Republican, is the lone GOP backer so far. The Senate may be another matter, even though Murray is the top Democrat on the Senate Health, Education, Labor and Pensions Committee. That’s because the GOP holds 53 of the 100 Senate seats. And its corporate controllers have shown little to no appetite for equal pay for equal work. CLUW “did targeted outreach to chapter and state leaders to reach out to Congress, and as a result of the coalition’s work every Democrat in the House and Senate signed on as a co-sponsor” to the Paycheck Fairness Act (HR7) before DeLauro introduced it Jan. 30, Executive Director Carol Rosenblatt e-mailed. 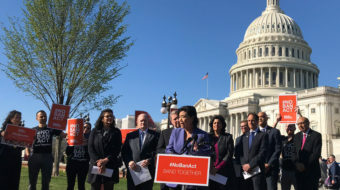 It also hosted a radio panel discussion, focusing on benefits for young people from both the Paycheck Fairness Act and the Raise the Wage Act, the Democratic and union-backed measure to raise the federal minimum wage, which has been at $7.25 hourly for a decade, to $15 by 2024. The Paycheck Fairness Act would reverse court and agency decisions which have chipped away at workers’ right to equal pay for equal work ever since the original law was enacted in 1963. The measure “would strengthen and close loopholes in” that law “by holding employers accountable for discriminatory practices, ending the practice of pay secrecy, easing workers’ ability to individually or jointly challenge pay discrimination, and strengthening the available remedies for wronged employees,” DeLauro’s summary says. Murray marshaled Lilly Ledbetter, the Alabama grandmother whose loss, on party lines, in a pay discrimination case at the Supreme Court more than 11 years ago led to legislation restoring workers’ unlimited right to sue for pay discrimination and back pay. While neither Murray nor Ledbetter said so now, union contracts go a long way – though not all the way – towards closing the pay gap. The latest federal data on union density show median weekly pay for union women is 86 percent of that for union men, who have highest median weekly pay. The median for union women is also more than the median for every category of non-union workers, men included. CLUW also got its chapters and state affiliates, as well as other unions, to co-sign a letter to lawmakers, drafted by the American Association of University Women and the National Partnership for Women and Families, urging Congress to hold hearings and vote on the measure. CLUW chapters signing the litter included those in Sacramento, Calif., Chicago, Houston, Detroit, Lansing, Mich., Ohio, Philadelphia, Pittsburgh, St, Louis, and Western New York. Other union signers were the AFL-CIO, the Pennsylvania Federation of Labor, the Government Employees (AFGE), both teachers’ unions, Graphic Communications Conference Local 24M/9N, IBEW District 3 and Local 29, the Machinists, the Auto Workers, the Letter Carriers, the Steel Workers and their District 10 and Local 1088, the Mine Workers, IATSE, the Service Employees and their Local 668, the Transport Workers. Other signers included 9to5, the Anti-Defamation League, the National Domestic Workers Alliance, the National Employment Law Project, and six state affiliates, and the National Organization for Women and most of its state affiliates.